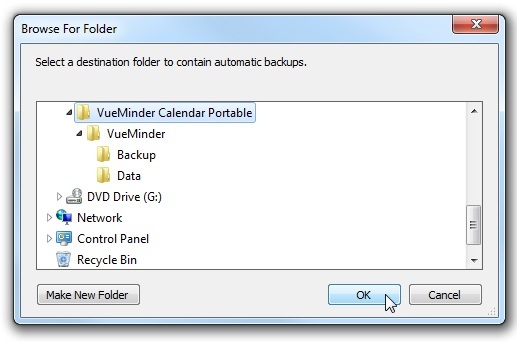 Click the "Transfer Data to VueMinder USB" command on the File menu or main toolbar. 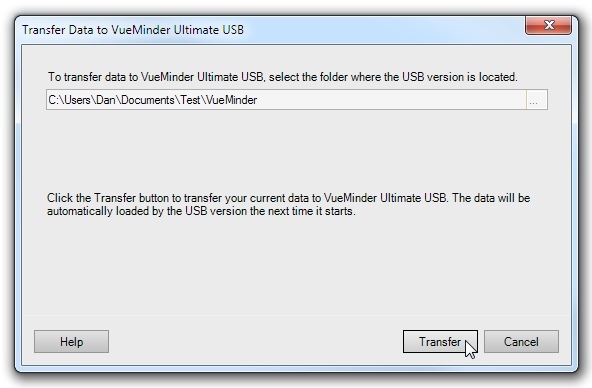 The "Transfer Data to VueMinder USB" command on the File menu and main toolbar provides the ability to transfer all your current data to the USB version. The USB version also provides a command for transferring the data back to the regular version, enabling data to be kept in sync. 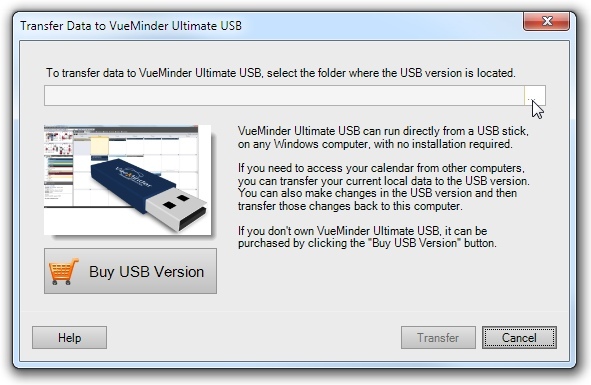 When the "Transfer Data to VueMinder USB" command is clicked, a window will appear for specifying the location of the USB version. If you don't own the USB version, you can purchase it by clicking the "Buy USB Version" button. If you currently own the regular Pro or Ultimate version, you'll receive an instant 50% discount on the USB version. To specify the location of the USB version, click the "..." button in the location field. Browse to the folder where the USB version is located and then click OK.
After specifying the USB version's location, the window will update and the Transfer button will become enabled. Click the Transfer button to copy the current local data to the USB version. This will transfer an exact duplicate of the current data, overwriting any previous data used by the USB version. You'll be asked to confirm the transfer. After clicking OK, a window should appear saying the transfer was successful. Depending on how much data you have, this could take a few seconds. The transferred data will be automatically loaded the next time the USB version starts. If the data is protected with a password in the Program Options, the same password will also protect the USB version's data.